Liberty Heights (NC) 2019 wing Juwan Gary. SALISBURY, MD - 2019 wing Juwan Gary impressed in his lone Governor’s Challenge appearance in 2017, and he picked up right where he left off in his return trip. 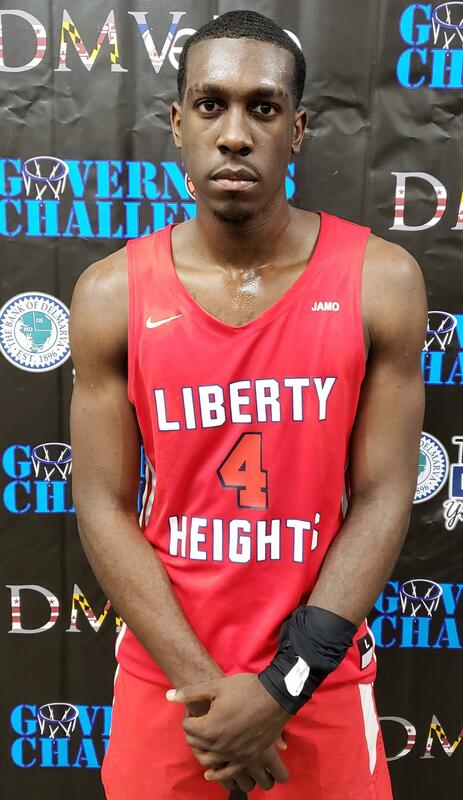 The Alabama commit scored a game-high 27 points to lead Liberty Heights (NC) to a 75-65 win over Wings Academy (NY), putting on a nice display of athleticism and versatility. The 6-foot-6 Gary scored all of his points from the field, shooting 11-of-19 overall and 5-of-9 from 3-point range to lead the short-handed Cardinals. Last year, Gary attended Gray Collegiate Academy (SC), which played in one game at the Governor’s Challenge and went on to win a South Carolina Class 2A state championship. He transferred to Liberty Heights over the summer. Gary added that it was important for him to get his recruitment wrapped up early so he could play out his senior season. After losing do-it-all lead guard Kevon Voyles to graduation, Stephen Decatur is taking an inside-out approach this season behind 2020 forward Churchill Bounds. The Seahawks have relied on experienced, college-level guards during this stretch of three straight 3A East region titles, but this season, that same backcourt luxury isn’t at their disposal. There’s only one senior guard on the roster (Brett Berquist) as Coach Byron Johnson tries to find some sort of identity within his guards. In a matter of one summer, Bounds has gone from a learning sophomore to a junior that is the backbone of the half court offense. Bounds didn’t have his best stuff in the 54-38 loss to Tallwood on Wednesday afternoon, putting forth 14 points -- still a team-high -- on 7 of 12 shooting and five rebounds, but he’s picked up traction on the recruiting trail as of late. The junior forward has no offers but he’s drawing interest from low-major Division I and Division II basketball programs. “[College coaches] like how I rebound. They like how I shoot the ball,” said Bounds, who has good vision in the post and a variety of back-to-basket moves. Through the first six games of 2018-19, Bounds has performances of 34 points in the opening-night 59-56 win over Queen Anne’s and 18 and 16 in the 87-44 romp over Pocomoke. The Seahawks dropped to 4-2 on the season Wednesday, with their other loss to Crisfield by 29 on Dec. 13. They turned the ball over 24 times, a byproduct of that inexperienced backcourt. At this point in the year, though, development is more important than results, especially with the Seahawks aiming for a fourth straight Final Four appearance. Seemingly every time Sidwell Friends (DC) needed a play in Wednesday’s game against St. Elizabeth (DE), Jason Gibson was there to make it. The 2019 guard finished with a game-high 27 points as the Quakers held off a late Vikings run to win, 53-49. The go-to scorer role is a new one for Gibson following the graduation of former star Saddiq Bey, who is now at Villanova. St. Peters (NY) looked headed to an easy victory as it built a 39-29 halftime lead against Smyrna (DE). In the second half, though, Smyrna increased the defensive pressure and cut the deficit to four points in the final two minutes beforeSt. Peters held on for a 67-62 win. St. Peter’s 2020 forward Liam Murphy admitted his team may have gotten a little comfortable with its lead. One of the day’s most anticipated games was the matchup of Oakdale (Md.) and Patterson (Md.) that had the look of a potential Maryland 2A playoff preview. The two teams may very well meet somewhere down the road, but Round 1 went to the Clippers - in emphatic fashion. 2019 guard Jalen Willis scored a game-high 26 points on 10-of-15 shooting as the Clippers pushed the pace and overwhelmed the Bears, 82-62. Schlee, Oakdale’s star 2019 guard, finished with 25 points and 10 rebounds but struggled with some early foul trouble. No other Bears player scored in double figures. Several players enjoyed statistically impressive outings on Wednesday’s opening day of Governor’s Challenge action. - 2019 guard Shi’Quhan Williams of Snow Hill (Md.) had 17 points and 18 rebounds in an 80-53 win over Indian River (DE). - 2020 guard Lethon Williams of Arcadia (Va.) had 19 points and 18 rebounds in a 55-46 win over Washington (DE). - Forward Jared Vazquez had 14 points and 16 rebounds for Salisbury School in a 62-56 loss to King’s Christian. - 2019 forward Tyson Brown had 15 points and 13 boards for Kempsville (Va.) in a 66-40 win over Queen Anne’s County (Md. ).